Many pet owners think tick season occurs during the winter months but you should know that it actually begins in early spring. 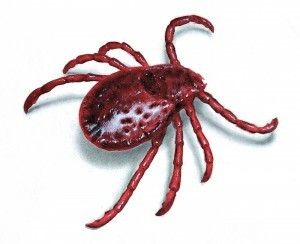 Usually, ticks are not detected until 6-7 months post infection. This usually falls during winters, however, in the spring is when you should be more cautious about your pets and ticks. Ideally, you should initiate tick prevention starting in April and have it last through late November. As you prepare for tick season, you should also begin prepping your family protection dog for Heartworm disease prevention, too. If you have a family protection dog, it is important that you learn more about Heartworms. Heartworm is a thread like worm that is classified as a type of filaria. It is potentially deadly and infects over 30 species of animals, most commonly dogs. Heartworms mature into the infective larval stage in its intermediate host, the mosquito. From there on, it is passed on to its new host, which could be a dog, cat or another wildlife through feeding. The larvae travel in the host’s circulation, passing through the cardiac and pulmonary arteries until they mature. This can take about 6-7 months. Heartworms can cause inflammation and cardiopulmonary system damage. Their presence can also cause blood clotting which can damage the blood vessels. If the filarial reside in the heart or lungs, they can produce baby worms. It is the baby worms that are picked up by mosquitoes and cause infection in other animals. Why Should I Test My Protection Dog For Heartworm? Symptoms of heartworm can include early exhaustion, cough, and congestive heart failure. Since heartworms are asymptomatic, your dog may appear normal if you only take a physical examination as a detection step. In fact, clinical signs of heartworm only show in 12 percent of cases. So it is important to have your pet tested regularly for heartworms so you can catch the disease before it progresses into a deadly illness. The infestation of heartworm in your personal protection dog can cause irreversible damage to the heart and lungs. If take your dog has any of the symptoms mentioned above, take them seriously. If diagnosed early, there are a number of preventive medicines available that can help fight the disease. These include Bravecto, Revolution, Heartgard and Nexgard which helps prevent heartworm, ticks and fleas in pets. If you live in Ontario, you should be absolutely careful about heartworms in your personal protection dogs. A study conducted in 2010 by Dr. Slocombe of the Ontario Veterinary College revealed 431 dogs carrying the heartworm disease. Out of these 431 dogs, 51 percent were those who had never stepped out of Ontario. Southwestern Ontario is considered a heartworm endemic area of Canada where the prevalence of this disease is 5-10 percent high in dogs. If you’re worried about heartworm infestations, check for heartworms in the spring and winter months. It is usually good to plan prevention between the months of June and November. In Ontario, testing for heartworms takes place between April 15th and June 1st. Shielding your dog from ticks and Heartworm disease is important. When you take the preventative steps above, you help keep your protection dog safe and healthy.